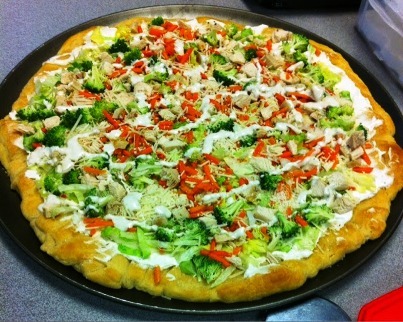 Caesar Chicken and Veggie Pizza is a great appetizer to bring to a Christmas party. I made mine in a round pizza pan and brought to my office party. I love when you can use a can of pillsbury crescent rolls for the crust. This is a twist on the usual veggie pizza, as this one uses Caesar dressing mixed in with the cream cheese.